Reading the Tale of Genji: Sources from the First Millennium (review copy courtesy of Columbia University Press and Australian distributor Footprint Books) has a fairly daunting remit. As the title suggests, the book aims to give an overview of how various readers, both casual and expert, have approached The Tale of Genji over the past thousand years. The approach taken is a chronological one, with the editors first transporting us back to shortly after Lady Murasaki had completed her work, before taking us on a journey which ends with some very famous names in the twentieth century. This is not the last time that the readers of The Tale of Genji will suspect divine intervention in the writing of the book. However, as we are to see, not everyone saw perfection in the novel, and as society turned more religious in the following centuries, Murasaki’s supporters were forced to defend her work. In the fourth section, ‘Obsequies for Genji’, we are shown how readers feared for the writer’s soul because of her many ‘lies’ over the course of her work of fiction. With impressionable noblewomen dreaming of Murasaki burning in Hell, this was a time of offering up prayers to the author of The Tale of Genji in the hope that this would ease her posthumous suffering. The final few sections then take us into a more critical era, tracing the progress of literary criticism in Japan over the past few hundred years via the treatment dealt out to Genji. This may be a little dry for some readers, but I was fascinated to see extracts of several works I’d heard mentioned before, such as Kitamura Kigin’s 1673 annotated edition of Genji, The Moonlit Lake Commentary (Kogetsushō), Motoori Norinaga’s 1799 commentary The Tale of Genji: A Little Jewelled Comb (Genji monogatari Tama no ogushi) and Tsubouchi Shōyō‘s more general literary criticism work from 1885-6, The Essence of the Novel (Shōsetsu shinzui). Perhaps of more interest to general readers, though, might be a short piece from the early twentieth century, reviewing the first volume of Arthur Waley’s groundbreaking full Genji translation into English. You see, it seems that Virginia Woolf was another fan of The Tale of Genji, particularly in its sense of aesthetics and the importance of its writer. 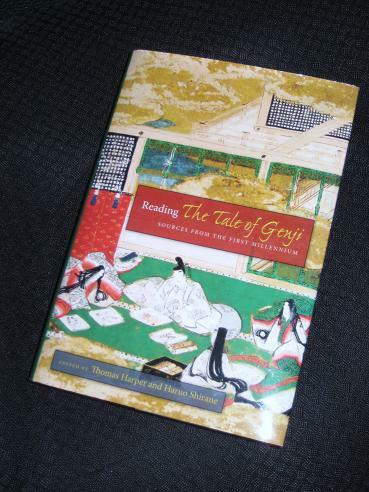 As mentioned, Reading The Tale of Genji is about far more than the book itself. In collecting the many pieces from a thousand years of study, the editors (with the help of a host of translators and other academics***) have shone a light on the changing nature of reading itself, showing the progression from a focus on aesthetics, plot and religious importance to the era of text reconstruction, and then on to more modern readings. We see how interpretations of Murasaki’s intentions shift over the centuries: successive commentators stress her focus on entertainment, moral instruction, the world of ‘mono no aware’ and political power struggles. It’s to the credit of the work that all of these theories sound equally plausible. In reading the introductory notes [kotobagaki] in the old anthologies, a person who is unfamiliar with this tale, since he has no precise knowledge of that world, will feel himself to be in terra incognita and will find many passages incomprehensible. Yet when one reads this tale with care and becomes familiar with the way things were in the world of the past, then not only the old poems but also the introductory notes, which one reads off in only a line or two, will come to feel intimately familiar, like something one sees or hears in the world of the present day, in one’s own native village. Then, of course, their emotional quality [mna] will be that much greater. Bravo! Interesting book, I mean this one, Tale of Genji is obviously amazing. I shall have to look into this one. I am an admirer and actually will look into more about Lady Murasaki after reading your work here. Thank you.